St Fagans National History Museum and National Museum Cardiff’s four year programme of events and exhibitions, to commemorate 100 years since the start of the First World War, began in earnest yesterday Monday 7 April 2014 when staff were sowing poppy seeds to remember those who have fallen in all wars. For the rest of the commemoration period, the poppies will provide an annual reminder and a place to gather and reflect. Sowing the poppies is the first in a series of events, exhibitions and publications that will be undertaken by Amgueddfa Cymru – National Museum Wales’ seven museums to commemorate the centenary of the First World War. For the next four years the Museums will be working with visitors to examine how the people of Wales responded to the call to war, sharing views on how it affected people at home and impacted on those fighting and working in the arenas of war. We’ll also explore how skills, attitudes and beliefs changed throughout the period and in the aftermath of war. 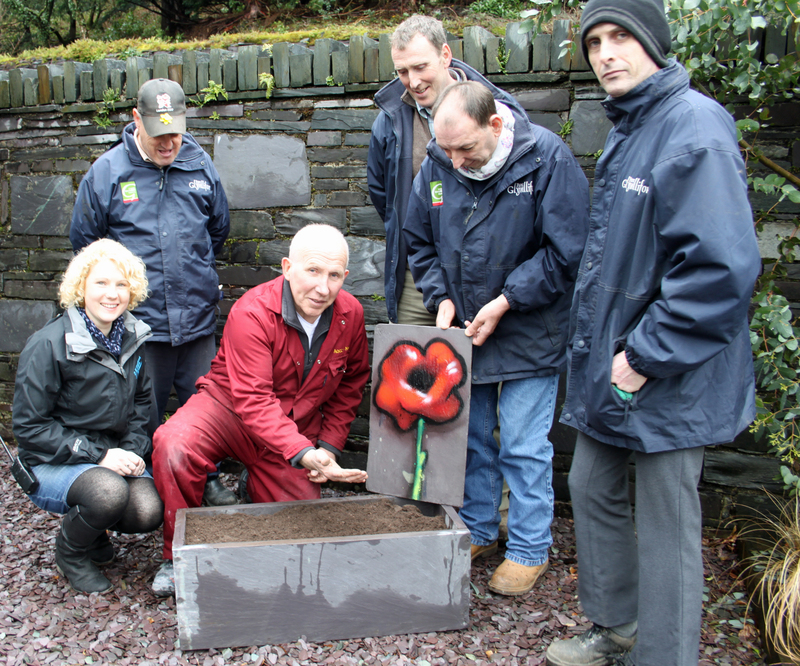 “We will be planting hundreds of poppies seeds at all our seven museums. The poppies should start to bloom over the summer months and for the rest of the commemoration period. The centenary poppy campaign is coordinated by B&Q and the Royal British Legion, and will see the UK awash with poppies throughout 2014 and beyond. “We warmly welcome this fantastic initiative from National Museum Wales. We thank them for supporting the Legion’s centenary poppy campaign in this way. The aim of the campaign is to cover the UK in poppies during the centenary period in commemoration of all those who died. More information about the campaign and other centenary activities can be found at www.britishlegion.org.uk”. National Museum Cardiff begins its commemorations on 2 August 2014 with the opening of Efforts and Ideals: Prints of the First World War. This exhibition brings together a series of lithographic prints commissioned by the Ministry of Information in 1917, to encourage a war-weary public and raise support for the war effort. The images illustrate some of the changing attitudes in society, such as women’s role during the War. These lithographic prints are works by some of Wales and Britain’s finest artists such as Augustus John and Frank Brangwyn. A partnership project with the National Portrait Gallery and Paul Mellon has brought about a strong response by young people to the Efforts and Ideals prints. The result will be displayed at the same time as the exhibition at National Museum Cardiff, in the form of posters, short films, monologues and animations. The famous open-air museum stands in the grounds of St Fagans Castle The War-time experiences of the Castle and its inhabitants represent some of the most enduring legacies of the impact of the First World War on Wales. On 28 August 2014 there will be an opportunity to discover the hidden WWI history of the manor house and its role as a convalescence hospital during the War. Communication will be the theme on 18 September and visitors can book sessions with curators to examine the Museum’s collections of WWI Postcards, telegrams and letters – objects that offer an insight into the everyday experiences of the ordinary men and women whose lives were touched by war, both on the home front in Wales and in the trenches. Cychwyn Cofio (A call to remember) opens in July 2014 at the National Slate Museum and will be an appeal across slate quarrying communities for information about the War and its influence on people’s lives. This will support and complement the work through their community programme, to develop two exhibitions planned for 2015 and 2016. A Dark Cloud over the Woollen Industry opens in the summer (1 July – 29 November 2014). This project explores the impact of war on the local woollen industry, as mills needed weaving contracts to stay open. The exhibition will tell stories such as how the Welsh Army Corps tried to promote a Welsh national identity, by clothing the new army in native homespun cloth called Brethyn Llwyd. The National Waterfront Museum is producing an exhibition called Working for Victory – Welsh Industry and the First World War (12 October 2014 – 15 March 2015). This touring exhibition examines the contribution of Welsh industry to Britain’s war effort. It will be accompanied by a programme of activities and events throughout 2014. In addition, the National Roman Legion Museum, Caerleon is taking part in the commemoration through an historical view on warfare. Equus: The Horse at War (27 June 2014 – 30 January 2015) looks at Roman warhorses and fittings, and explores comparisons with how horses were used in the First World War. This follows the Wales Millennium Centre’s performance of War Horse and the recent find of a horse’s head gear at the Priory Field excavations. Please visit the website www.museumwales.ac.uk / www.walesremembers.org for more details on our four year programme. Amgueddfa Cymru operates seven national museums across Wales. These are National Museum Cardiff, St Fagans: National History Museum, National Roman Legion Museum, Caerleon, Big Pit: National Coal Museum, Blaenafon, National Wool Museum, Dre-fach Felindre, National Slate Museum, Llanberis and the National Waterfront Museum, Swansea. Admission to all Amgueddfa Cymru – National Museum sites is free, thanks to the support of the Welsh Government.